f (a) + f ′(a)(x − a). 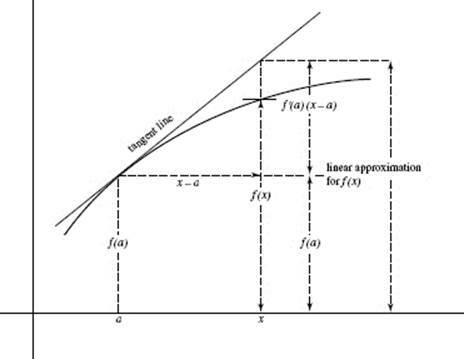 where f (a) + f ′(a)(x − a) is the linear or tangent-line approximation for f (x), and f ′(a)(x − a) is the approximate change in f as we move along the curve from a to x. See Figure N4–20. In general, the closer x is to a, the better the approximation is to f (x). † Local linear approximation is also referred to as “local linearization” or even “best linear approximation” (the latter because it is better than any other linear approximation). Example 31 shows how small the errors can be when tangent lines are used for approximations and x is near a. Estimate the value of at x = 0.05. SOLUTION: Use the line tangent to at x = 0; f (0) = 3.
so f ′(0) = 6 ; hence, the line is y = 6x + 3. At x = 0.05, we have f (0.05) ≈ 6(0.05) + 3 = 3.3. The true value, to three decimal places, of when x = 0.05 is 3.324; the tangent-line approximation yields 3.3. This tells us that the curve is concave up, lying above the tangent line to the curve near x = 0. Graph the curve and the tangent line on [−1, 1] × [−1, 6] to verify these statements. Approximating the Change in a Function. By approximately how much does the area of a circle change when the radius increases from 3 to 3.01 inches? A(3) + A ′(3)(r − 3). A ′(3)(r − 3) when r = 3.01. (b) the area of a cross section? (a) Let D and C be respectively the diameter and circumference of the cylinder. Here, D plays the role of f, and C that of x, in the linear approximation equation (1) a previous page. The approximate increase in diameter, when C = 8π, is therefore equal to D ′(C) times (the change in C). Since C = πD, and (which is constant for all C). The change in C is given as 2 cm; so the increase in diameter is equal approximately to 2. 0.6366 cm. Since the change in C is 2 cm, the area of a cross section increases by approximately 4 · 2 = 8 cm2.